Hapa Bento has a great themed bento challenge each month, and this month the theme is Picnic! I thought a lot about what to make, and I always associate bugs with picnics. Bleh, hate those bugs! 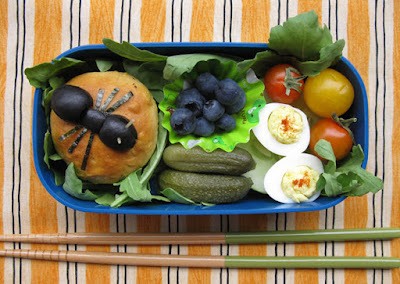 But a cute little olive ant is a welcome addition to this Picnic bento. I made an ant out of olives, nori (toasted seaweed), and a few pieces of dried spaghetti for his antennae. The ant is surveying the picnic spread from his perch on a biscuit filled with ham and spices. The spices are a blend called Duqqah that I picked up from The Handmade Pantry. 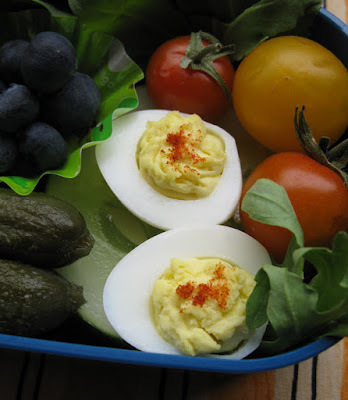 In the rest of the bento: blueberries, cherry tomatoes, deviled quail eggs (! ), a slice of cucumber, two homemade pickled cornichon, and arugula. I love this arugula from Ridgeview Farms in Healdsburg. It is so spicy and delicious! 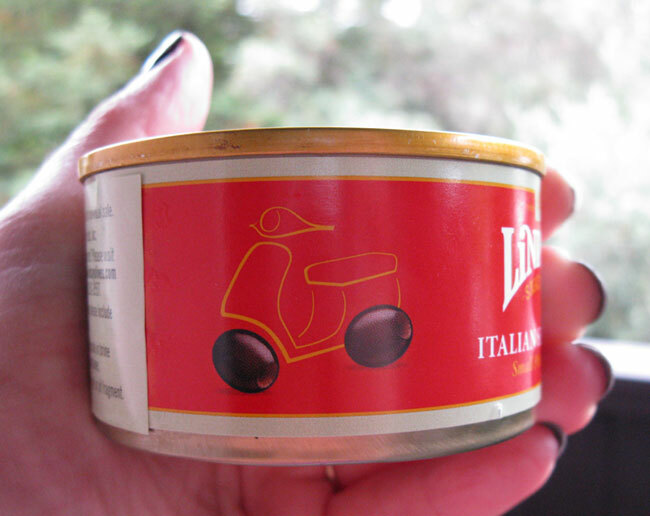 I purchased a four pack of small olives at the grocery store the other day, and honestly, I was really sold as soon as I saw them use this scooter image on the packaging. Beep! Beep! 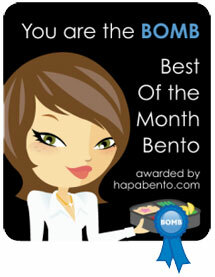 I also included this bento in Shannon's What's For Lunch Wednesdays blog. 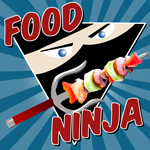 Check it out to see what other bento bloggers are creating! Rinse quail eggs in warm water to remove any dirt or feathers from the shells. Fill a small pot with water and add vinegar. Add quail eggs and bring water to a boil. Boil for 5 minutes, then remove pan from heat and take it to the sink. Run cold water into the pan and gradually pour out the hot water. Allow eggs to cool then gently peel. The vinegar should make it easier to remove the shells. Carefully cut eggs in half and remove yolks. Place yolks in a bowl. Add mayo, wasabi, and salt to taste. Blend well. Transfer yolk mixture to a plastic bag and snip a small piece of the corner of the bag off. Carefully pipe the yolk mixture back into the egg white halves. Top each with a little pinch of paprika. Makes 12 teeeny tiny deviled eggs. This is so good! I love your ant on the perch! Your deviled quail eggs look super! Good job! Hello and thanks for leaving me a message in KidsDreamWork.com! The olive ant is definitely a cute one with the spaghetti antennae! Love the 'makeover' you've done on the quail eggs too! Thanks Kids Dream Work! I saw your post on Shannon's What's For Lunch Wednesdays post. It's so fun to see what creative things other people are coming up with. Welcome to my bento blog, I hope you like it! Deviled quail eggs. wow! They look positively professionally done! And that ant -- EWWWW!!! I'm so glad you like them, sheri! You're the Quail Egg Mastah! I have a few more eggs to try, so thanks in advance for giving me so much great inspiration. Oh my, I love the ant! I wish B would eat black olives, I'd make him one. He does love deviled eggs though (requests them from my SIL whenever we are back home, she brought him a whole tray of them!). Shannon, I think you could make the same effect with red or black grapes. Call it a fire-ant with red grapes and I bet he would love it! That was a real neat ant!!!! Love the picnic bento espcially with those fresh blueberries and mini gerkins! Thanks Angeleyes! It is fun to think about what you can make with simple shapes like ovals and circles. You recent bear and caterpillar bentos are great ways to put shapes together to make really cute creatures! Fun and colorful picnic bento! I love the creativity and whimsy you bring to bentoing, SB! Lovely recipe looks like a must-try, YUM! Hey, if you like, I can send some floss to you via mail but not sure if they will confiscate them cos I know it is very strict in the States re meat products? Susan, that's such a nice compliment! Thank you! Thanks bentobird! It just kind of came to me, wouldn't it be hilarious to make deviled quail eggs?! I scaled the recipe down to make just this one egg, but unless you are bentoing, it doesn't make sense to just make one. Tono-mama, thanks for your nice compliments! I will try to find pork floss at my local asian market. Does it have to be refrigerated or is it ok on the shelf? Thanks Mrs. Ed! It's good to see you here again! Hi to Mr. Ed! I found some pork floss, Tona-mama! They labeled it as Pork Fu at the asian market. I am going to give it a try. Thanks for your generous help! Wow..the little olive ant is so cute & pretty...look real! Love it love it. You are so creative. Thanks for your kind compliment Emily! I love your bentos, too! 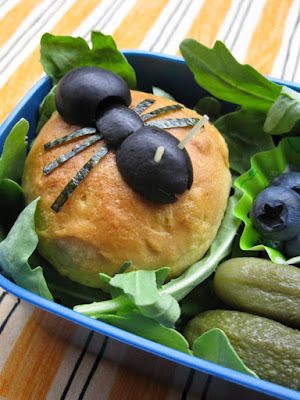 I'm thinking take away one olive and add two legs and you have a great creepy spider for Halloween! Can't wait to do this for my kids. And thanks for the deviled quail egg idea. I made it yesterday and both kids were ecstatic. Ooo Sara that's a great idea! Perfect to adapt for Halloween! The deviled quail eggs really weren't much different than regular deviled eggs, just smaller.